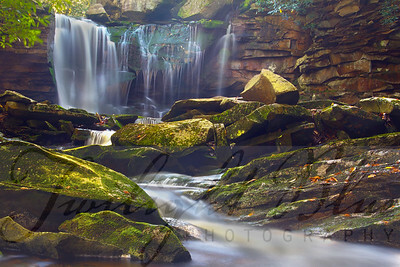 “Elakala Falls Magic” Sitting in the stream below the 40 foot cascade of Elakala Falls in Blackwater Falls State Park, West Virginia is a magical experience. The sound of the water rushing overpowers all other sounds taking you into a world all of your own. The image was captured using High Dynamic Range (HDR) with a Canon 7D and 16-35mm lens. 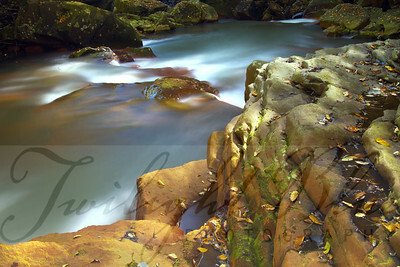 “Blackwater River“ Being a part of nature gives me a thrill. Sitting in a river trying to capture its fury gives me an even bigger thrill. 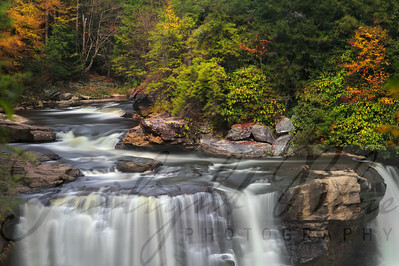 This image taken in Blackwater River at the base of Douglas Falls, West Virginia on a cool autumn day epitomizes the strength of the river by the rocks it has molded. The multiple exposure, High Dynamic Range (HDR) shot minimizes the harsh mid-day light shining on the slippery stone on what otherwise would have been considered a bad day to shoot waterfalls. “Amber Rocks” The amber rocks in the river below Douglas Falls, Douglas, West Virginia are unique to the region. Their color is a result of the acid deposits from the Acid Mines. 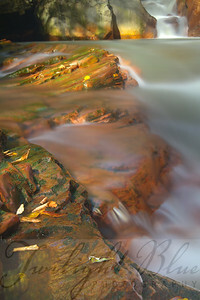 To capture this image I perched myself on one of the rocks approximately 30 feet below the sides of the riverbank, placing my feet and tripod in the rushing water. The close-up angle shows the definition of hard lines of the rock contrasting with the flowing water with the 35 foot cascade in the background. 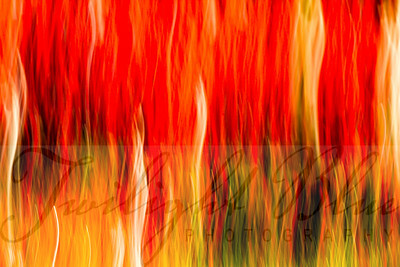 “Autumn Fire” This image portrays the feverish color that runs rampant throughout Canaan Valley, West Virginia in the fall season. The vibrant red of the huckleberry bushes can be seen for miles in the Dolly Sods Wilderness area located in Monongahela National Forest. The abstract image was created in-camera using a Canon 7D and 16-35 mm lens. “The Final Bend“ Blackwater Falls is the highlight of Blackwater Falls State Park located in the Allegheny Mountains near Davis, West Virginia. The 62-foot (19 m) cascade is where the Blackwater River leaves its leisurely course in Canaan Valley and enters the rugged Blackwater Canyon. This detail captures the final bend of the river as it spills below. 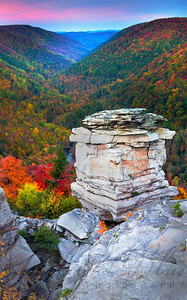 “Lindy Point Overlook” Looking out over the Blackwater Canyon at Lindy Point in the fall is one of the most breathtaking locations you may find. The Blackwater State Park highlight is worth the short hike in the pitch black to capture the sun coming up over the mountains lighting the white rocks and setting the autumn colors ablaze. This panoramic image was created using five images and stitching them together capturing a vertical image overlooking the canyon.